A reliable source for Baghouse information and a resource for accessing leading Baghouse and suppliers. 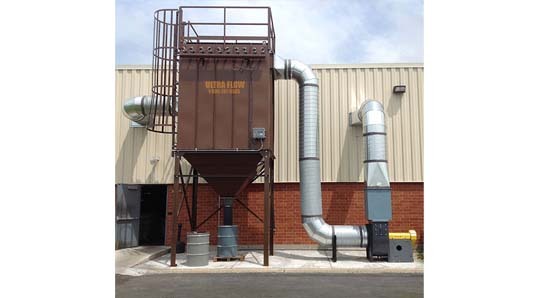 Typical baghouse dust collector applications include dust capturing, separating and filtering explosive media, metalworking chips, toxic media, wood dust, concrete dust, welding fumes and incinerator smoke. Facilities usually incorporate baghouses into large dust collecting systems, with overhead ductwork and capture arms (suction hoods), which hang over the workspaces where dust is formed. In large facility applications, the baghouse is often located outside, connected to the interior through ductwork. 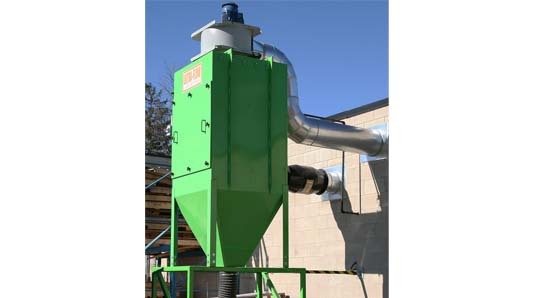 Bag houses operate by drawing contaminated air in through ducts to a hopper-shaped structure containing fabric filters. The air is pulled through the fabric bags by a vacuum-creating fan, leaving behind dust, smoke and particles; clean air exits through the fan at the outlet at the top of the baghouse, while dust particles settle into an airlock at the bottom of the hopper, which is routinely emptied. During the filtering process, the fabric filters accumulate a layer of dust called a dust cake, filter cake or filtering cake. The main function of the filter fabric is to provide the medium on which the dust cake will form; once enough dust has accumulated, it creates a barrier that is capable of capturing very fine particles. The filter cake must be managed, however, because it can become too thick and prevent acceptable air flow. There are three main ways of managing the filter cakes. Mechanical shaker bag houses clean their filter bags through vibrations caused by a motor-driven shaft and cam. These vibrations cause waves in the bag that shakes the dust cake off the inside surface of the bag and into the hopper. Reverse-air baghouses are compartmentalized and allow for continuous operation during their cleaning cycle. In order to begin cleaning, filtration is halted in the compartment about to be cleaned. Clean air is then injected into the dust collector in a reverse direction, which pressurizes the compartment and causes the filter bags to partially collapse. This results in the filter cake cracking and falling into the hopper below. Reverse-jet baghouses also allow for continuous operation during their cleaning cycle, but are typically not compartmentalized. Instead, the filter bags are cleaned by short bursts of compressed air injected through a compressed air manifold. Common materials used to make baghouses include cotton, glass-fiber and synthetic materials.